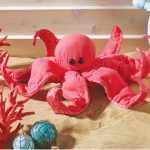 Kids will have a lot of fun making this friendly Balloon Octopus Craft. 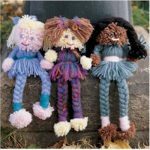 It’s inexpensive and easy to make. When it’s finished, attach a length of elastic to the top of the balloon and enjoy the satisfying sound of his colorful legs banging together. 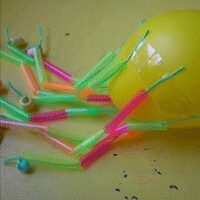 Cut the straws into one inch lengths and thread them onto eight pieces of string. 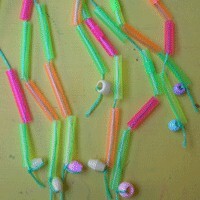 We tied a bead at the end of each of the pieces of string to form a 'foot' and to stop the straws from falling off the end. Blow a small puff of air into the balloon and tie off. Then tape the legs to the side of the balloon. Tape on buttons for eyes and draw a mouth with a permanent marker. Each issue of Kids Craft Weekly outlines a selection of activities for young kids. The ideas in are intended to be cheap, educational and fun and can be used as suggested, or simply as a starting point from which you can develop your own plan of attack.